TRIO Roofing Systems Inc. not only services the commercial, industrial, institutional, municipal, and high rise condominium population of its home base of Brampton Ontario but for the entire Greater Toronto Area (GTA). 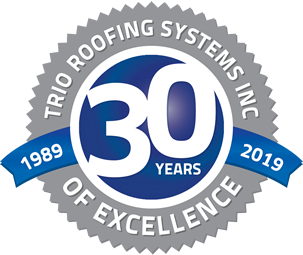 Our community values, expertise, and track record for safe and successful installations, repairs, and maintenance have made TRIO the area’s go-to roofing company for well over two decades. No matter what your roofing needs are we have you covered, literally. TRIO was incorporated in 1989 and has led the way in the construction and roofing business ever since. With a minimum of 15 years on the job, our foremen are considered master-craftsmen in their field. Their crew too is well seasoned, with team members logging tenures between 5 and 25 years in the roofing industry. TRIO Roofing employees are members of the Roofers Union Local 30 and the Sheet Metal Union Local 30. Even our office staff comes with a minimum five years of experience in the field so that customer inquiries are met with knowledgeable points of contact. Word of Mouth has carried TRIO through 30 years as clients have come out of the woodwork to secure the services of our roofing business. There could be no better way to gain confidence in TRIO than by hearing from our satisfied customers. In addition to intangible community accolades we are also members of, and in good standing with, CRCA, OIRCA, TCA, AMCO, RCI and we are an Accredited Member at ContractorCheck.